On Inner Voice, composer/bassist Mike Frost takes you on a musical voyage filled with exuberance, passion, reflection and joy - music to affect the soul! Savor the compositions. Most selections are original works which emphasize Mike's ability to elaborate on these musical themes. The remainder of this album includes fine interpretations of several jazz classics and a composition by J.S. Bach. Enjoy the fine array of musicians featured on this recording, for they were chosen carefully to compliment each piece. 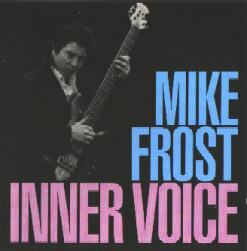 "Electric Bass guitarist Mike Frost hits a funky groove with Inner Voice... In all, an impressive debut album by a name to keep an ear out for." "Rather than playing it safe, as most artists tend to do on their debut releases, Mike and friends stretch out in a variety of jazz genres, covering both standards and originals and showcasing his diverse range, impressive chops and brilliant improvisational skills." "Tasty fusion with a touch of hometown pride."